Minimum spend for dine-in RM75 (RM18.75 after discount) and for Take away and Delivery, minimum spend is RM150 (RM37.50 after discount). Minimum one order of main course and one drink per person. Valid for selected items only. (Normal portion sizes used). Valid for dine-in, delivery, take-away. (Not available for Room Service). While Stock last. 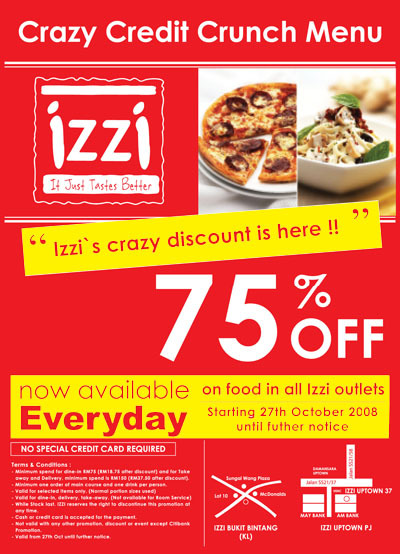 IZZI reserves the right to discontinue this promotion at any time. Cash or credit card is accepted for the payment. Not valid with any other promotion, discount or event except Citibank Promotion. This entry was posted on Tuesday, November 18th, 2008 at 4:42 pm	and is filed under Food Promo, Heavenly Klang Valley Food, Western Restaurant. You can follow any responses to this entry through the RSS 2.0 feed. You can leave a response, or trackback from your own site.